On Sale! $3 off regular retail price of $10 (4oz size). 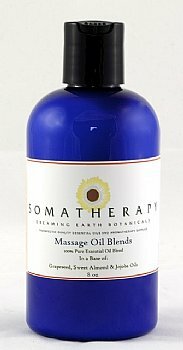 Essential Oils of Rosemary, Juniper and Lavender essential oils in our Massage Base Oil (Almond, Grapeseed and Jojoba). Use straight from bottle for soothing massage for tired or fatigued muscles, rub on after bath or shower to moisturize skin, or add capful to warm bath to ease aching muscles. The four and eight ounce sizes come in a Cobalt Blue bottle.